Includes R-Type and R-Type II. R-Type Dimensions is coming to Switch and PC via Steam this winter, developer Tozai Games announced. 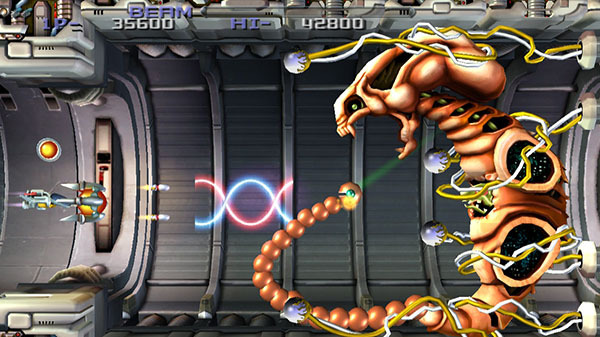 First released for PlayStation 3 and Xbox 360 in 2009, R-Type Dimensions includes both the eight-stage R-Type and six-stage R-Type II. Each game is playable in the 2D graphics of their original arcade version or new 3D graphics with upgraded sound. Players can switch between graphics modes on the fly. There is also a new “Infinite Mode” where you can play with unlimited lives, a “Co-Op Mode” where two players can play together (supports one Joy-Con per player), and other elements like slow motion, fast forwarding, achievements, and player statistics.